Mid-1990’s scandal immortalized in drink. No doubt the color is due to an artificial agent. With our luck, said agent might have been toxic if the product came from China. All the fun without the risk, expense or inconvenient of the whitewater in the channel for raft happily go. i sure could go for some pink water..
“A Scientific Breakthrough! Canned Rapids! Driving is dangerous! It produces toxic fumes and reduces exercise! 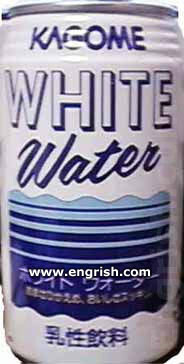 Do your part for the environment and buy canned White Water when you wanna go rafting! Enjoy straight from the can or on the rocks!